Measuring reputation: What methods and procedures are best? In today’s digital world, just about every action leaves a trace. This fact has radically changed the basic dilemma of marketing analysis: in the past, we had small amounts of imprecise data, while today the deluge of structured information accessible through the most well-known analytics tools has changed the playing field. The mantra is no longer that we’re working with a dearth of data, but rather that we require a level of organization that enables us to understand the data and put it in context. The precision of advertising analytics has thereby grown, not only thanks to the development of new platforms and the volume of data available, but also thanks to the measurement structures and standards that have been adopted around this data. As a result, the task is relatively simple when your key performance indicators (KPI) can be measured with precision through your data system, for example, a target number of transactions to attain, or an average cart value to maintain. But what if your KPI can’t be measured through your platform? How can you measure brand awareness or sentiment? Below you’ll find suggestions to guide your thinking around how to measure the effectiveness of a brand campaign. As in any good analysis, the first step is to determine your methodology, and state it in a clear and precise way in your concluding report. There are a number of elements to take into account. Although an enormous amount of data is available, you’ll have to verify its integrity and validate the official list of data sources you are going to use in your analysis. Pay attention to the scope of data you’re using: if you’re only using Google Analytics, your data will be limited to your site. If you want to know how your users are behaving beyond the borders of your own site, you’ll have to look to other tools, like your Facebook insights, for example. Social statistics from your Facebook page or ads: include all social indicators from the platform including likes, shares, followers, comments, etc. Statistics from your Search and Display networks: search intention, impressions and clicks on your branded keywords, etc. These platforms regurgitate very precise data (impressions, clicks, etc.). But why limit yourself to this type of quantitative data? With survey tools like Google Surveys, you can ask your users relevant questions directly. Here you can see that the methodology used relates the KPIs to the user’s purchase cycle. First contact (awareness, the user becomes aware that your brand exists), consideration (the user connects their need to your brand), then action (conversion). The analyst’s task here is to recreate the user journey, and attach the KPIs that will be best able to measure each step. 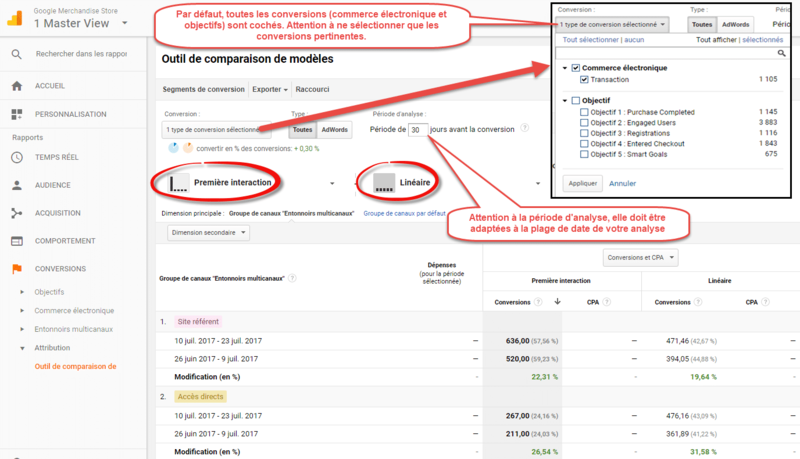 Finally, don’t forget to use Google Analytics’ multichannel reports. Most of the time, analyses are done with the Core Reporting API, which includes the majority of reports. The MCF API allows you to attribute a value to each point of contact in the user journey, not just the last one. 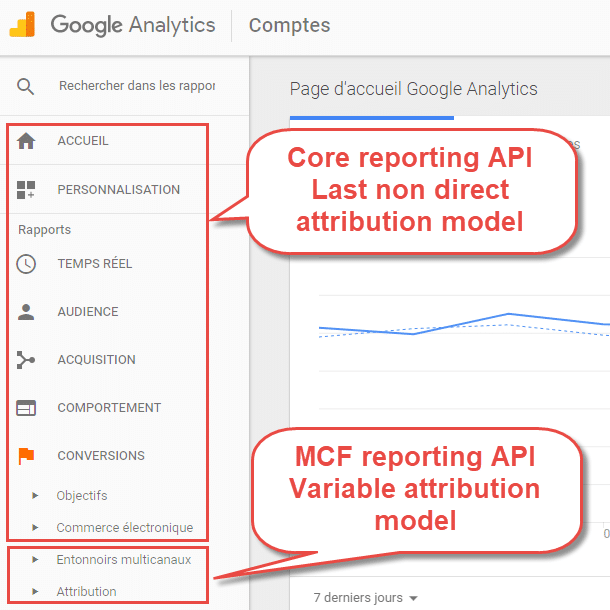 Pay attention, too, to the logic of this API; it functions solely on conversions (goals and transactions), and not on the traditional indicators used by the Core Reporting API (sessions, users, page views, etc.). 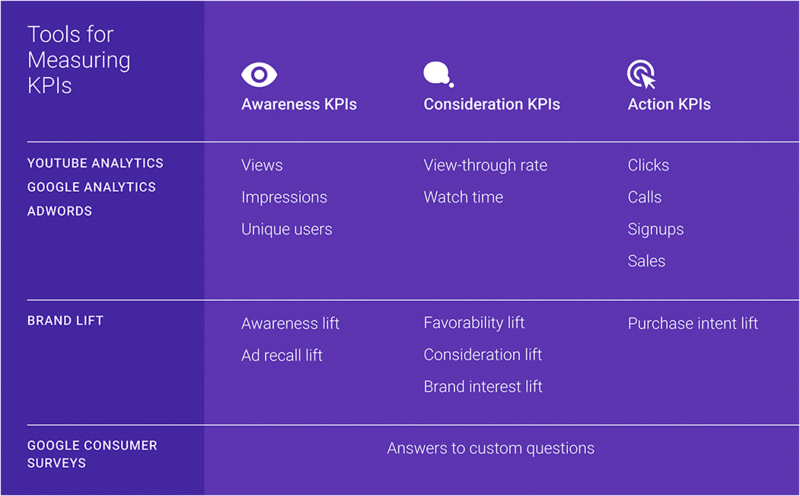 Given that brand campaigns are intended to raise awareness and not to convert, an analysis using a first click attribution model or a linear model would be far more relevant in this situation than the last non-direct model used in the majority of Google Analytics reports. Equal duration of date ranges. Note that this criterion isn’t obligatory in the sense that you can also use averages to compare date ranges of unequal duration. Number of weekend days present in the analysis, which could impact results. Seasonality of the site: end of December and early January are always lower for most sites, but it also depends on your industry: the RRSP season will boom for personal finance sites, and November/December before the holidays are busy months for e-commerce sites. The integrity of your measurement system: was it consistent and reliable over the two periods? Does your site get enough traffic for an honest week-over-week comparison? If not, you can instead take an average by day/week/two weeks. 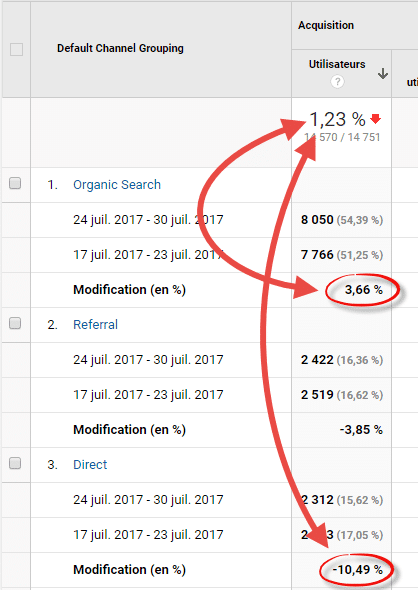 The first step is to compare how the contribution of the channels involved (organic and direct) has evolved in comparison to overall traffic, both in terms of volume (from 800 to 1,000 sessions, or +200 sessions) and contribution (from 5% to 10%, or an increase of 5 percentage points). This analysis is available directly in most platforms like Google Analytics shown here. Variation coefficient: the standard deviation divided by the average, which gives you the average variation of the series of numbers. You’ll then be able to compare your variation by subtracting the variation coefficient. 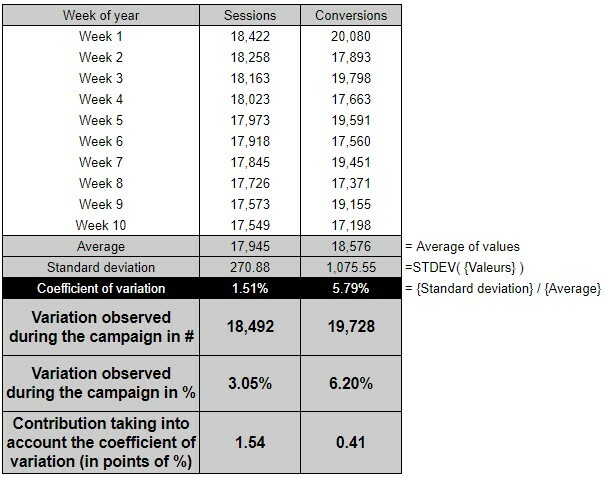 Then you’ll see that just because the variation of the indicator is higher during the campaign, it doesn’t mean that it has a greater impact: although conversions increased more than sessions, the campaign made more of a difference in terms of reach than conversions. Consider varying your data sources! The majority of users use only Google Analytics for these types of exercises, but other sources can be gold mines for this type of analysis. Among others, survey tools are easier to implement than ever. They put you in direct conversation with your users – not something you’ll want to miss out on.